Dr. Balsera is fluent in English and Spanish. 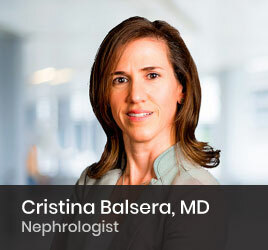 Dr. Balsera, prior to joining Florida Kidney Physicians, was a solo nephrologist serving the Brandon area since 2000. Her clinical interests include management chronic kidney disease, acute kidney injury, severe and resistant hypertension in addition to management of fluid balance in patients with advanced congestive heart failure. She is a key member of the FKP Ambulatory Operations and Clinical Excellence Committees through which the new practice aims to enhance the entire spectrum of care for our patients, with a focus on improving overall well-being and reducing hospitalizations. She currently serves as Medical Director of U.S. Renal South Tampa Dialysis Unit, located in Brandon, where she oversees in-center hemodialysis, as well as peritoneal and home hemodialysis. She is an advocate for home modalities of kidney replacement therapies as she strives to keep patients independent and physically active in order to improve their overall quality of life.